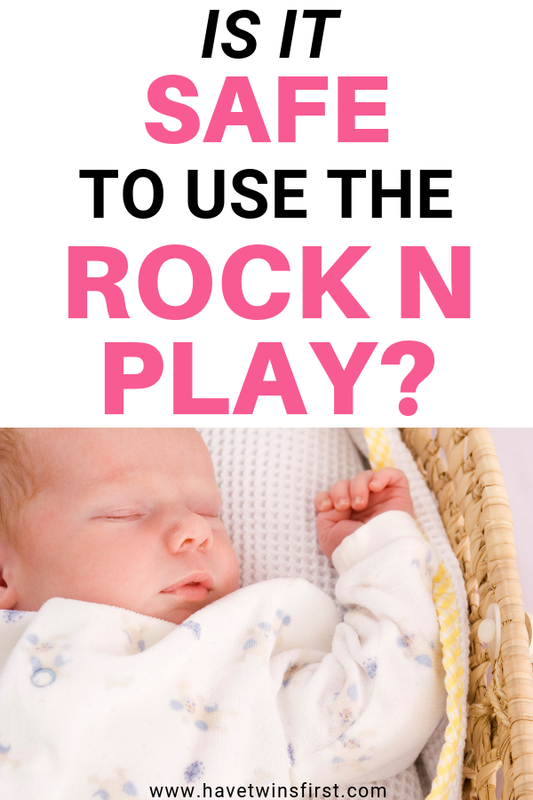 With the news today that 4.7 million Rock N Play sleepers are being recalled, the time has come for many parents sooner rather than later to transition your baby to a crib from the Rock N Play sleeper. The Consumer Product Safety Commission is recommending parents stop use of the Rock N Play sleepers immediately. Originally, it was reported there were 10 infant deaths since 2015 due to improper use of the Rock N Play after babies are able to rollover. However, since then Consumer Reports released its own findings that they have recorded at least 32 infant deaths in the Rock N Play sleeper. With some of these deaths occurring before 3 months old and therefore before a baby is able to rollover. The Consumer Reports article led the American Academy of Pediatrics to issue a statement asking for a recall of the Rock N Play sleeper. And, today that recall was initiated by the Consumer Products Safety Commission. I find this information very upsetting. All three of my children slept in the Rock N Play sleeper during their first 3 months of live. Additionally, I had heard rumors that the Rock N Play was unsafe when my twins were newborns 4 years ago. We asked our pediatrician and she said it was absolutely safe. With this information we felt good about using the Rock N Play. So, with all this information in mind, in this post I will review how to transition your baby to a crib from the Rock N Play. The goal is make this as simple a process as possible. Well this is easier said than done, right? I know from personal experience, my third baby was so addicted to sleeping in the Rock N Play. So, what can you use instead of a Rock N Play sleeper if you still want to have your baby sleep in your room? 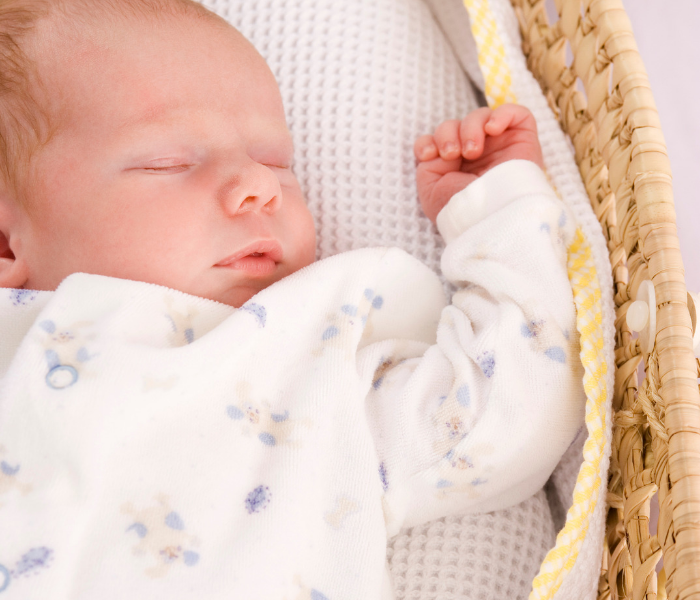 Some choices include the 2 in 1 rocking bassinet and portable crib or the Arm’s Reach cosleeper. Swaddling your newborn will help him sleep through Moro reflexes. I know some parents swear their baby hates being swaddled. And, I can’t speak for every situation because parents know their babies the best. But, I can share my story. My husband and I both thought one of our twin girls hated swaddling too. But, she also wasn’t sleeping well or in long stretches. We remembered a friend had given us a DVD called the Happiest Baby On The Block. We watched and it explained how important swaddling is, even if you think your baby hates it. So, we gave it a shot. We made the tightest swaddle we possibly could, or used one of our velcro swaddles. We rocked and soothed her to sleep. And, voila after a few days of sticking with this method she was sleeping better! Eventually through the night or nap she would slowly break just her arms out. But, by then she was sleeping more deeply, so most of the time it wasn’t an issue. 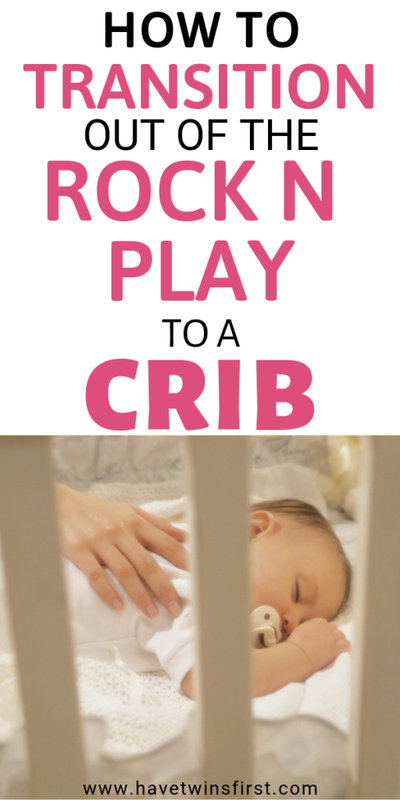 Transitioning your baby to the crib from the Rock N Play will not necessarily be a simple task, but there are some things you can do to make it easier. If you are reading this and your baby is under 3 months old, I highly recommend having your baby take at least 1 nap a day in his crib. You can start doing this from the day you bring your baby home from the hospital. This is an easy way for your newborn to get used to sleeping in a crib. I had a difficult time transitioning one of my babies to the crib from the Rock N Play, which is one of the reasons for this post. So, what are some hacks you can use to help with the transition? The first step is to establish a bedtime routine. All this means, is doing the same thing every night before putting your baby to bed. An example would be a diaper change, changing into pajamas, swaddling your baby, singing your baby a lullaby, then putting him down to sleep. Do these exact steps every night, in the nursery, and over time your baby will start to understand these are cues that it’s time to go to sleep. My next used to be to move the Rock N Play into the nursery. However, this is not possible anymore. If you transition to a different sleeping device that’s portable, then move that device to the nursery for 2-3 nights. Otherwise, just go straight for the crib. One thing we always ran into at our household, was around the same time our babies grew out of the Rock N Play, they also were breaking out of their swaddle. Our solution to this was the Baby Merlin sleepsuit. I absolutely love this baby sleep aid for the age of 3-6 months. Another option is to have your baby sleep in a Sleepsack. Besides helping with transitioning out of swaddling, the Baby Merlin sleepsuit also helps with transitioning your baby to sleeping in the larger sleeping quarters of a crib. The last thing you can do, and this what we had to do with our third baby, is let your baby cry it out. Implementing this method will depend on your comfort level. Letting your baby cry is incredibly difficult, BUT, it only lasts 2-3 nights and after that both baby and parents are happier because they are both getting more sleep. Personally, I was not comfortable letting my babies cry it out at bedtime until they were at least 6 months old. My recommendation is to make sure you feel comfortable with the cry it out method before trying it. Additionally, you should have a plan that you can stick to. Otherwise, the cry it out method could turn out to be a big waste of time. I will say that after 3 nights, it’s a very successful technique for getting your baby to sleep. I feel it’s definitely worth it in order to get your baby sleeping well. You can also use the cry it out method if your baby is waking consistently in the middle of the night. This was what we had to do. One of our babies would wake up after being asleep for a few hours in his crib. The only way to settle him was to move him back to the Rock N Play sleeper. But, at this point, he was getting too big for the Rock N Play. So, we decided to try the cry it out method to get him sleeping in his crib, and by day 4 it had worked! There are two other things I want to mention that I think will help your baby sleep better. The first one is to have a sound machine in the nursery. Hearing white noise reminds babies of the being in the womb. This can help them sleep longer. As they get older, into the toddler years, the noise machine is also helpful to drown out other noises around the house, that might otherwise wake them up. I also recommend investing in cordless blackout shades. Blackout shades prevent light from shining through the windows. They can help your baby sleep longer both during naps and in the mornings when the sun comes up. With the recall of the Rock N Play sleeper, there is going to be a large focus transitioning babies into new sleeping quarters. Remember to always follow the manufacturer’s safety guidelines.